The RigidBot, a new entry into the affordable category of consumer 3d printers distinguishes itself by its extendability. The printer uses standard components that they claim are available at any big hardware store. So if the base build volume of a 10 inch cube is not large enough, you can pop off the sides, and with a few changes, have a larger printer. The RigidBot Kickstarter has smashed through its stretch goals and will include a 1kg spool of PLA with each printer. The printer is designed to print PLA, with an unheated build platform, though they have tested it successfully with ABS and some of the newer wood filaments. It hits the 100 micron resolution most 3d printers have. Their test prints they show off have some stringing and dropped blobs, which might be fixable with good calibration settings. 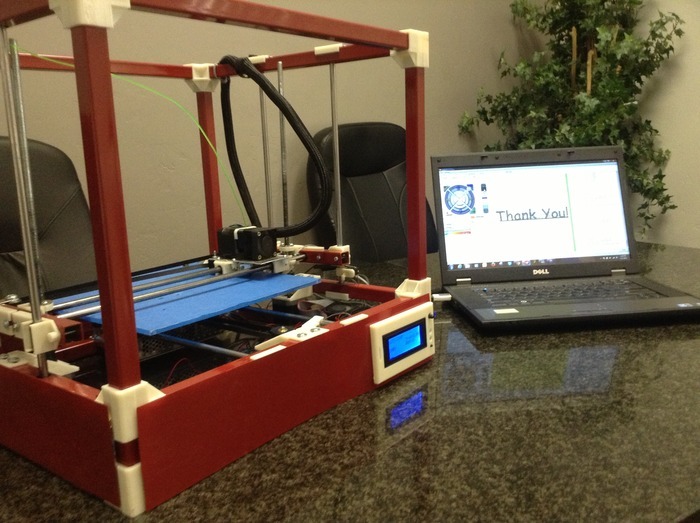 An add-on RigidBot offers is a LCD and SD card reader to operate the 3d printer without a computer connected. Normally the RigidBot uses Slic3r and Pronterface to interface with the device. The RigidBot seems a viable competitor to other affordable printers, like the Solidoodle or Robo3d. With RigidBot’s expected delivery date of late this year, unless you’re buying the large kit specifically to make big prints, you’d be better off going with the much shorter lead time of one of the established companies. If printing big is your thing, there are still kits for the big RigidBot available with a base price of $535.